The typical gamer household has several electronic devices connected to their television sets or monitors such as multiple gaming consoles and cable boxes. Switching between them all can sometimes be a huge inconvenience; Getting behind your entertainment center to switch out HDMI cables because your television doesn’t come with enough inputs is time better spent actually enjoying a game or movie. To help out with that situation, NYKO has created a perfect solution. Their Console Selector provides more HDMI inputs and a single HDMI output to give you the ability to seamlessly connect up to 3 game consoles, set top boxes, computers or other HDMI devices to a single HDMI port. Switching between your different devices just got a lot easier. This product from NYKO immediately caught my eye because, as the owner of several different gaming consoles, I often have to crawl behind my entertainment center and switch out A/V or HDMI cables; my television and my surround sound system just don’t offer enough inputs for me to have the devices that I use on a regular basis connected all at once. The NYKO Console Selector offers 3 HDMI inputs so that you can connect them to a single HDMI port. In order to determine which device is currently displaying content, the front of the Console Selector has LED indicators. These will light up to illustrate which device you are currently using. There is also an LED indicator for the output to let you know that you are connected to a television or monitor and it is receiving a proper signal. The NYKO Console Selector is very compact and measures just a paltry 4 3/8 X 2 3/8 X 1/2 inches so it is easy to hide and will blend in nicely with the rest of your electronic equipment. This switching device is powered by most newer HDMI devices so there is no power cord needed. However, if your HDMI devices are older and don’t put out the necessary juice needed to power the Console Selector, it has a built-in micro-USB port and comes with an micro-USB cable to give it the extra power to send out the signal properly. In addition, while the main unit has a button on the top that you must press in order to switch between active devices, the Console Selector also comes with an IR remote so that you don’t have to cross the room whenever you decide to use a different device. 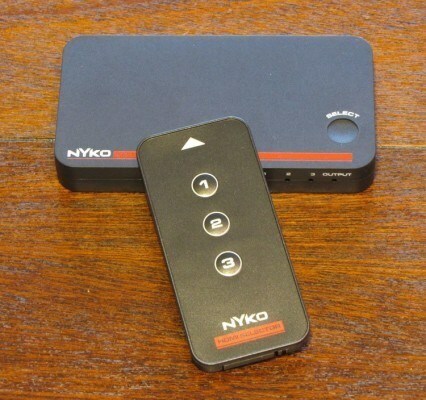 I know what you are thinking – “One more remote control to keep track of?” – but NYKO has thought of everything and made it so that the IR remote can be programmed into any standard universal IR remote. I currently use a surround sound system that offers three HDMI inputs and one output. If you are anything like me, this still doesn’t offer enough inputs for all of the consoles that I play as well as the cable box and a DVD/VCR recorder. 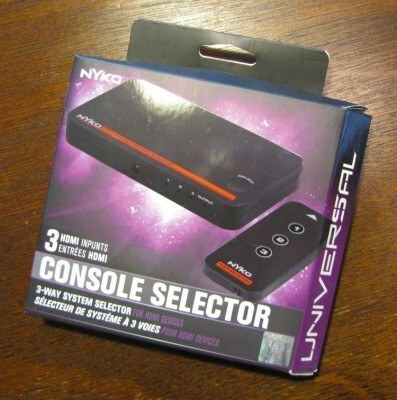 The NYKO Console Selector allows me to connect up to three devices to one HDMI input which effectively triples the number of inputs that I have available to use for my devices without having to shell out for a more expensive surround sound system that offers more HDMI inputs. Going that route could be prohibitively more expensive for those gamers on a budget so purchasing the Console Selector is an economical way to allow you to connect all the devices that you regularly use. 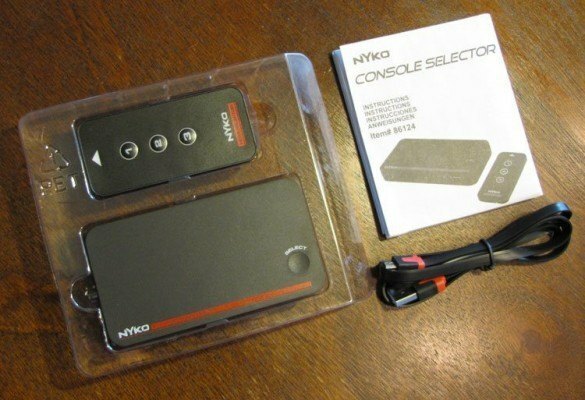 The NYKO Console Selector was easy to install and just took a couple minutes to connect all of the devices that I wanted to try out for this review. The one issue that I had was that the Console Selector is so light that it would not sit flat on my entertainment center shelf because of the natural tension in the four HDMI cables that I had connected to it. However, that is not a deal breaker and just took a little bit of adjusting to get it to stay in the spot that I had picked out for it. After many hours of usage, the Console Selector performed admirably as the signals from the many devices that I connected to it were very crisp and clear and I had no degrading of the audio/video signal at all. NYKO is offering the Console Selector on their website for just $29.99 which isn’t a bad price for what this device offers and a heck of a lot cheaper that buying a new surround sound system or other more expensive device switchers on the market.